The upside to record snowfall in the Sierra Nevada this last winter is obvious and not-so obvious. The obvious? A great and long snowboarding and skiing season. A for instance is Mammoth Mountain. It recorded a record 640.5 inches of snow, smashing the old mark of 578.54 in 2005-06. Consequently, the popular California ski resort will be open daily through July 4. The not-so obvious? A great and long whitewater rafting season. A for instance is the Kern River, where the feeding snowpack is nearly 190 percent of normal this year. "We're expecting a VERY long season with great water flows. The period around the peak (probably the first two weeks of June), will be a little tricky, but it will all be worth the long balance of great water as the peak subsides. "We've put off our Forks trips until June 20th, but other than that, we should be able to run the Upper Kern through the first two weeks of August and the Lower Kern through the month of September." Having enjoyed trips down the Kern with Kern River Outfitters, I can personally attest to the great time you’ll experience. And if you’re a fisherman, take a fishing rod. The trout action ain’t bad on the Kern, either. 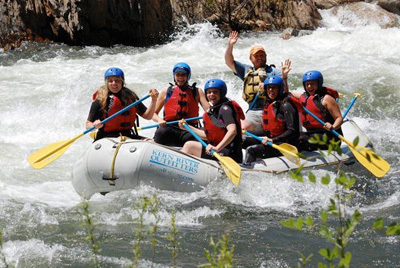 Kern River looks like an exciting place for these white water rafting adventures. I hope I can experience that there someday.